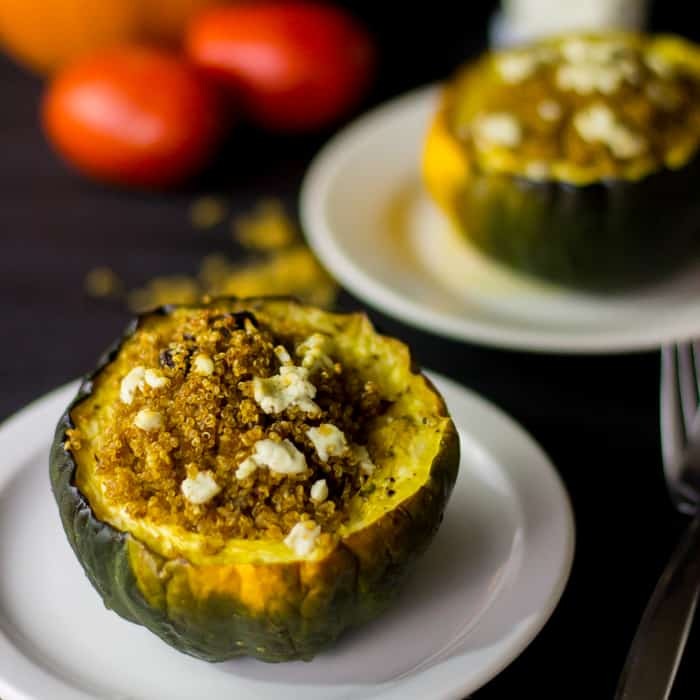 This Vegetarian Stuffed Acorn Squash is baked with quinoa, brown butter goat cheese and delicious sun dried tomato! It’s healthy, delicious and loaded with flavour! I’m pretty much in love with quinoa, and then when you start to add in flavours like sun dried tomato, goat cheese and more seasonings, I’m quinoa’s girl. What happens, you may ask, when you take all of that love, want a baked stuffed acorn squash recipe and roast it with brown butter? Lately, I’ve been exploring new vegetarian lunch options that I can throw together in the morning. I’ve realised that leftovers are pretty much the easiest thing next to a sandwich for lunch. That’s where this vegetarian stuffed acorn squash recipe came in place. I had time the night before to whip up something for dinner and then have the rest for lunch the next day…except it never made it to lunch. It kinda all got scarfed down the same night. Oops. Back to the drawing board. You see, that’s the problem when dinners are that good, you never know what may happen the next day. WHY would I want to chance the world ending and not getting to finish my brown butter roasted acorn squash?! Exactly. I’m going to cut to the chase – this is one delicious, filling, nutritious and (again) tasty fall dinner. 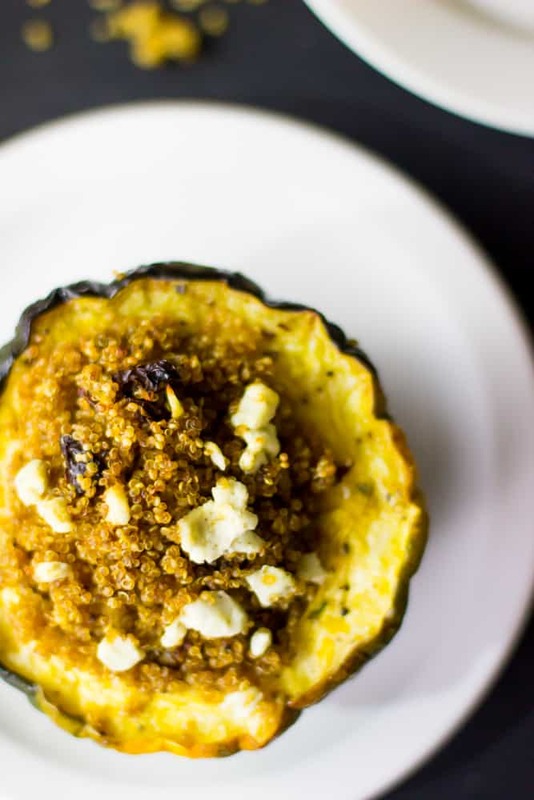 The name is kind of self-explanatory, but with this quinoa and acorn squash recipe what you get is a burst of flavours. From the sun dried tomatoes and the goat cheese to the quinoa. Then, in one bite you also get the soft, mellow but delightfully flavoured acorn squash accompanying it. The funny thing about being a food blogger is that I would definitely make this again, but I’m always so excited to try new dishes! The conflict, it’s devastating isn’t it? I’ll be a good sport and take one for the team; I’m definitely making this one again. Preheat oven to 400 degrees Fahrenheit. 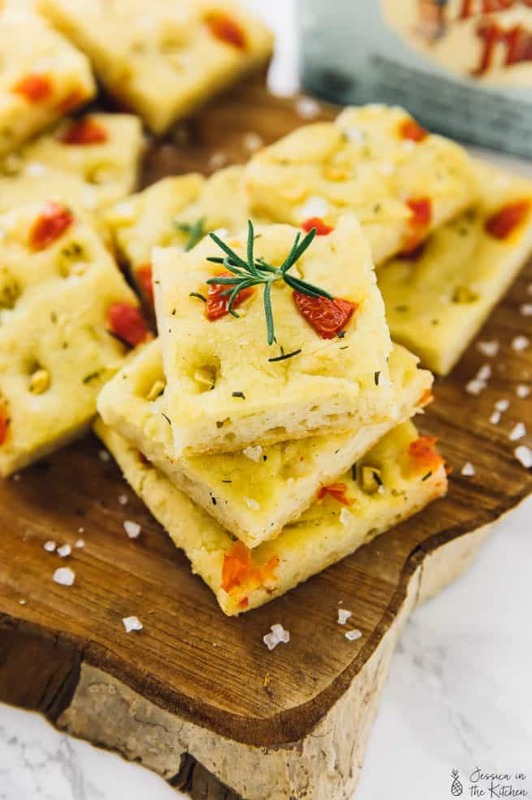 Fill an 8x8 baking dish with an inch of water and set aside. 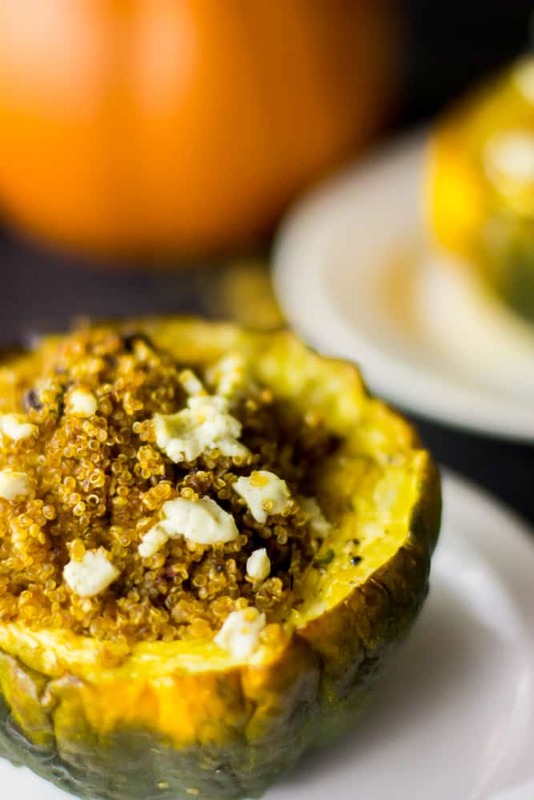 Ensure your acorn squash is scooped so that the quinoa can fit neatly into it. Brush the tops and insides with the butter. Cut the bottoms of the acorn squash so that it sits in the baking dish without falling over. Bake for 45-55 minutes until fork tender. While the acorn squash is roasting, in a pan over medium heat heat the quinoa and the onions together, stirring, for about 5 minutes until the onions have softened slightly. Add 1 1/2 tablespoons of goat cheese and the sun dried tomatoes and remove from heat. Mix all the ingredients into the quinoa. Set aside. When the acorn squash is finished roasting, remove from oven and allow to cool for 5 minutes. 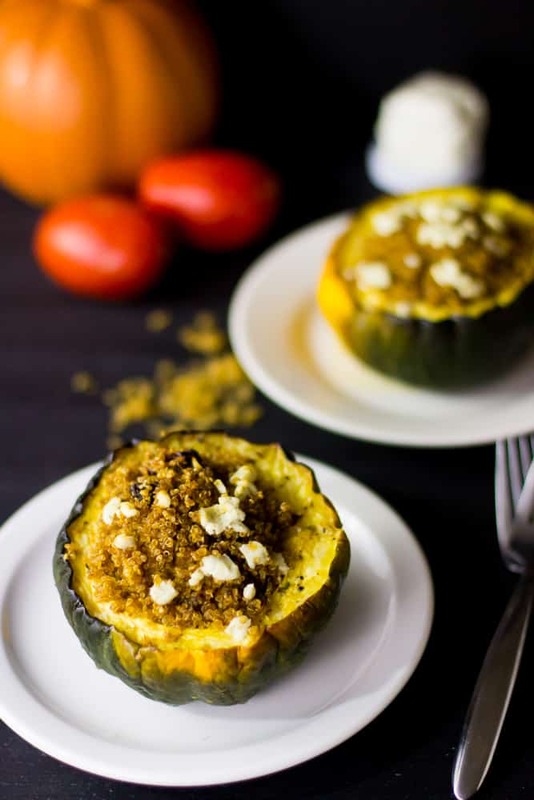 Scoop the quinoa packed into the acorn squash (you may have some leftover quinoa) and top with remaining crumbled goat cheese. If you try this Vegetarian Stuffed Acorn Squash please let me know in the comment section below, or tag me on instagram with the hashtag #jessicainthekitchen! For more exclusive recipes follow me on Instagram AND on Snapchat: jessinkitchen. Wow this looks too good girl. Pinned. This really does look and sound heavenly! I love the way you think, Jessica. This looks awesome! I really haven’t used many of the yummy fall squashes yet this year. Not sure why! But this looks great! what a beautiful autumnal dish! 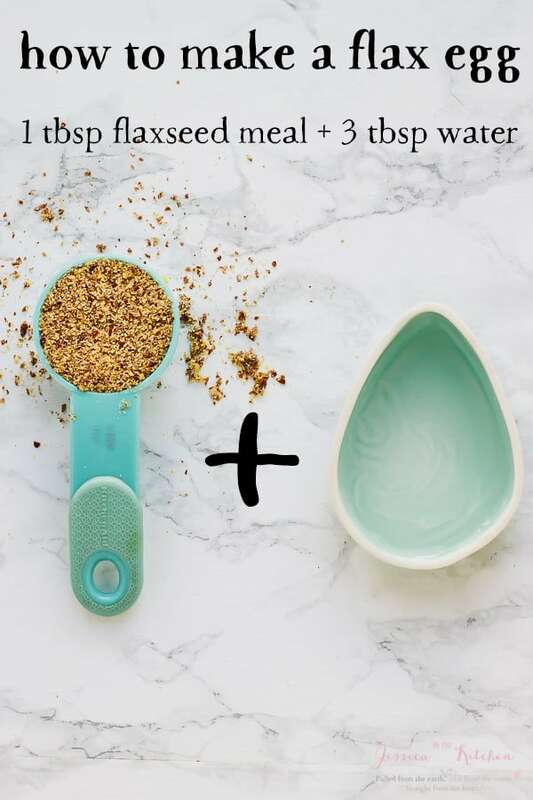 Love how simple yet complex this recipe is, Jessica! The pow of the sundried tomatoes with the creamy feta, the body and nutrition of the quinoa and squash and the toastyness of the brown butter! This sounds so comforting! Thank you for this lovely recipe!! I love this! 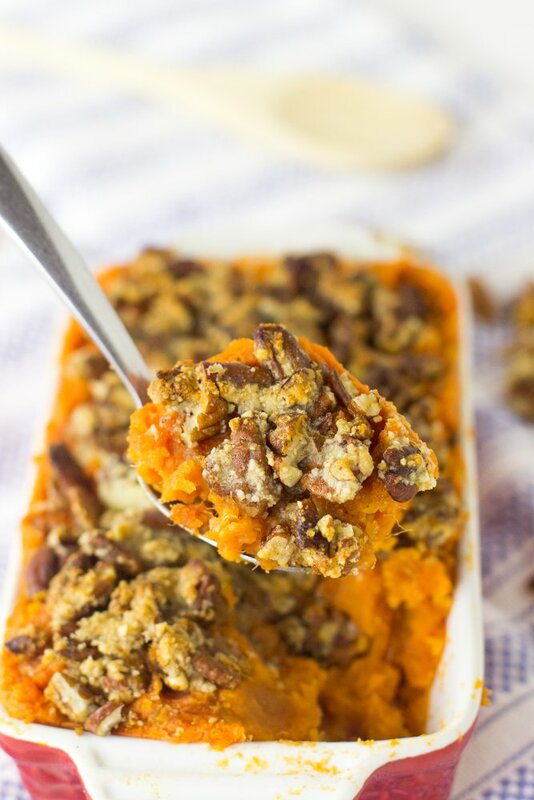 You pretty much took all my favorite fall foods and put them into one! What a great idea for a vegetarian meal! So filling, healthy and with sooo much flavor! 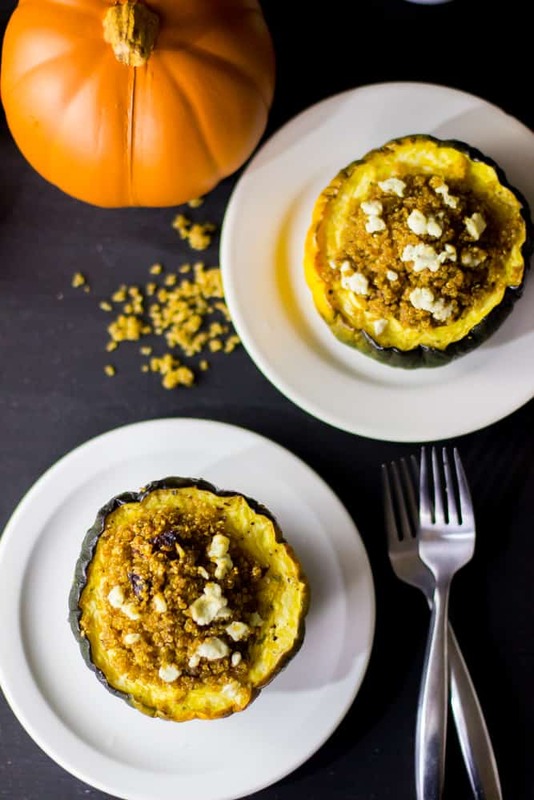 I just love stuffing acorn squash! I haven’t tried stuffing them with quinoa yet, but after seeing this something tells me that I must! Looks fabulous, Jessica! 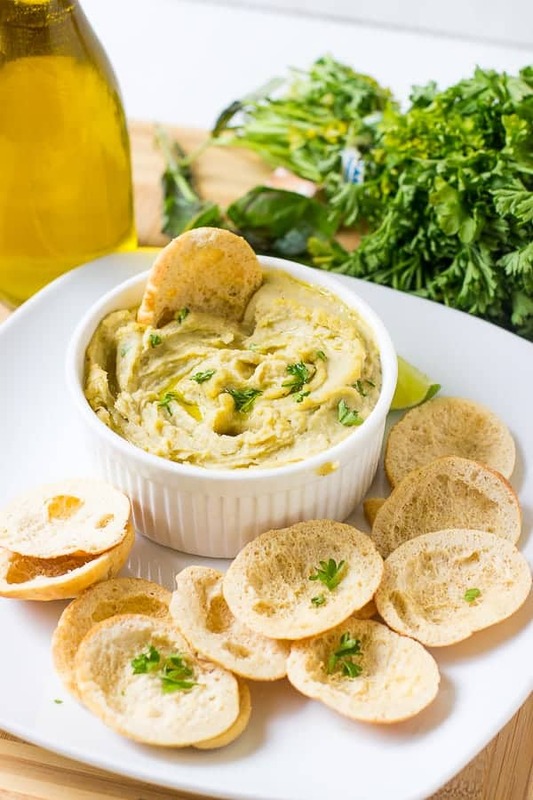 Jessica you had me at goat cheese and stuffed veggies – absolutely obsessed with them. Beautiful photos too.